Oct 13 Comments Off on When Should Dental Implants Be Considered? teeth. He presented with multiple missing front teeth that negatively affected his smile and his public presentation; had several infected abscessed teeth that required root canal and crown treatments to be saved; and had gum infections that would require many appointments to treat. He would require sedation and Novocain to get through these appointments. termed Periodontal Patients, because they require regular periodontal maintenance care the rest or their lives, otherwise they face increased risk of tooth loss. An alternative treatment plan was to remove natural teeth and replace them with dental implants. This option would require a surgery appointment with sedation and Novocaine similar to the conventional option, but only one treatment appointment would be required. Upon reviewing both of these treatment plan options the cost for each option was almost the same. 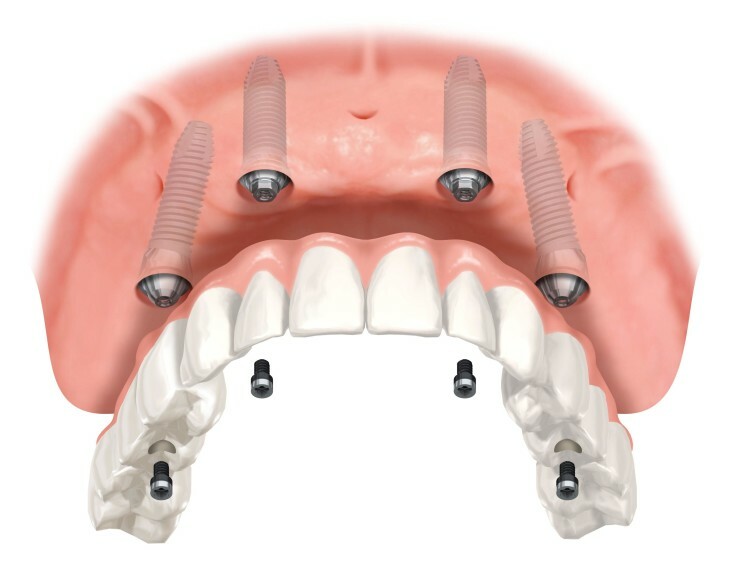 After reviewing the plans the plan using dental implants was chosen. The reason for choosing this option was based on the fact that conventional treatment would require more appointments where sedation and Novocaine would have to be used. done in one appointment under comfortable sedation and the follow up appointments would not require any local anesthetic injections or painful treatment. Lastly, the cost for both options was going to be close to identical. From the perspective of the anxious patient the implant option was the best choice. It is not unusual for patients faced with this kind of prognosis to attempt to change and become compliant dental patients. Unfortunately many of these people discover the difficulty of staying compliant with long term maintenance plans and drop out of the program. For many people like this, dental implants are the best long term treatment option for several reasons. Dental implants don’t decay and gum disease seen around natural teeth is not the same around dental implants. Dental implants can also stimulate jaw bone to grow up and strengthen around the implant, something never seen around natural teeth, and because dental implants are made of titanium they are stronger than natural teeth. The cosmetic results using implants can be excellent when everything is done properly resulting in a beautiful smile. Jun 01 Comments Off on Why Are We Different? 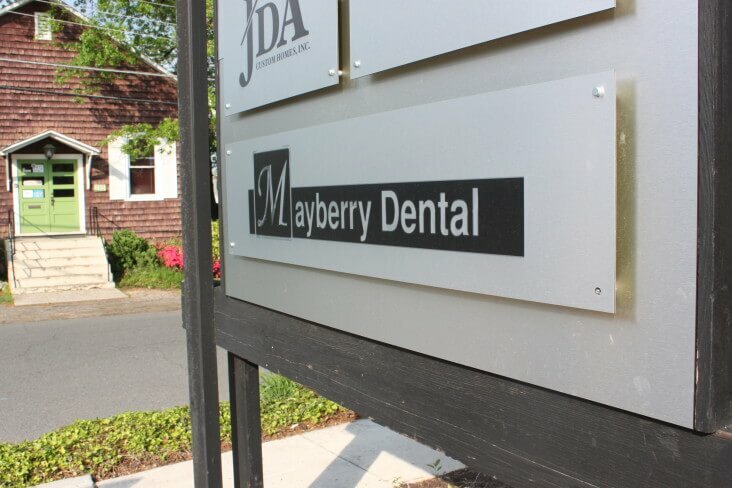 At Mayberry Dental we are different from most other general dental practices. A general practice has the freedom to offer any dental service to patients that meets the Standards of Care that has been set for that particular treatment. While most other general practices do not offer “specialty care” and send their patients out to other doctors for treatment they do not provide, at Mayberry Dental our goal has always been to provide specialty treatments in addition to our regular general services. Over the last 36 years we have continued to improve and become proficient providing the most common dental specialty services, especially surgical services and treatments associated with dental implants treatment. Orthodontic treatment was the first specialty area of continuing education that we invested in, starting in 1980. Shortly thereafter our dental implant training and education began. In 1983 we first replaced a missing tooth with a dental implant. Since then we have successfully treated hundreds of orthodontic patients, adults and children, and have provide the Hybridge dental implant treatment, to replace all the upper or lower teeth. This techniques, commonly advertised on “TV” as “teeth in a day” or “all on 4” has allowed us to replace multiple teeth in one day with provisional teeth, or temporary teeth. Then after a sustained healing period these temporary teeth are replaced with the permanent teeth fabricated a few months later. The difference between us and the others is that we use more supporting implants, but at a cost similar to using only 4 implants. This allows us to be faithful to our philosophy of always providing the best service for our patients a fair fee. We have instituted and utilized the latest dental technology in the practice to stay current and maintain a high standard of care. We use digital x-rays that decrease patient and staff exposure to the lowest levels in all of healthcare. We have invested in 3D x-ray, using SIRONA cone beam technology allow us to visualize and diagnose conditions that were not possible previously. We have used CEREC CAD Cam technology since 1996. This technology allows us to fabricate permanent all porcelain crowns in our office in one visit, no temporary crowns required. We are one of a handful of general dental practices permitted to use IV sedation in the entire region. Our goal is to generate and foster a relationship of trust and confidence with our patients, treating them as members of our own family as good friends.